Nurses are well skilled in their assessment ability - but assessment does not just stop at the bedside. As Nurse Educators, we need to assess if there is a need for the education that we provide. 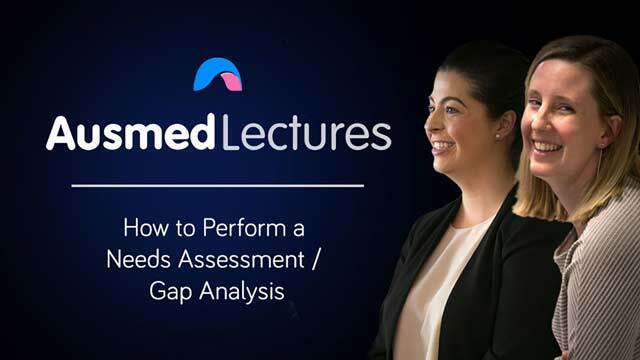 Join Hilary Bush and Zoe Youl as they take you through a step-by-step explanation of a rigorous needs assessment framework that is used at Ausmed Education. A vital tool that can be easily applied in any setting and a must-watch for all Nurse Educators. Zoe Youl is a Critical Care Registered Nurse, Nurse Planner and Online Education Manager at Ausmed Education. Before commencing at Ausmed Education, Zoe worked as a Critical Care Registered Nurse in Intensive Care at a large private hospital in Melbourne. She values the ability of education to enable personal and professional growth, is a passionate teacher and has experience as a Sessional Academic teaching undergraduate nursing students. Zoe is a member of the Australian College of Nursing (ACN), the Australian College of Critical Care Nurses (ACCCN), the Australian Nurse Teachers Society (ANTS) and the Association for Nursing Professional Development (ANPD). She holds a postgraduate qualification in Clinical Nursing (Intensive Care) and is currently undertaking a Master of Nursing (Leadership and Management). Zoe was recently appointed the Victorian Branch Representative of the ANTS National Committee. Zoe is committed to improving the health and lives of all people through the development of effective and meaningful education whilst also promoting the impact of unique nursing roles. Great session giving me a much better understanding of what, how and why education sessions are needed. Thanks great introduction to a needs assessment. Was very informative and good example used > will be helpful in making future assessments.